#EMSEA14 was held at Gothenburg University, a centre of marine science, in the medieval heart of the old city of Gothenburg. Gothenburg is a lovely city on the west coast of Sweden. The Swedes there are friendly, with a relaxed graciousness and their attitude, along with the city’s many parks, canals, walking, biking and well-organized public transport system, make it an easy and enjoyable place to navigate. Gothenburg boasts Sweden’s biggest science centre as well as a wonderful aquarium and maritime museum. 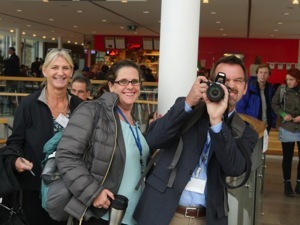 Lobster season was open as the conference began and so were the hearts and minds of attendees from around the world, ready to be inspired about ocean literacy and best practices in marine science education. This blog is just a sketch of the conference, it only includes a few of the presentations and the view is my own. I also tweeted at the conference, (@AnneinBamfield) and you can find everyone’s tweets by looking at #emsea14 on Twitter. I also invite you to comment, tweet, retweet and mention. If you are interested in more detail and want to learn more, go to the EMSEA web-site and link to the conference site where all the presentations will be posted. 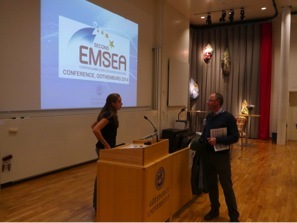 A big shout out goes to the organizers of this conference including the EMSEA team, the University of Gothenburg and their friends at the Maritime Museum & Aquarium, Universeum, Sven Lovén Centre for Marine Science at Kristineberg and the upper secondary sailing school, Öckerö Gymnasieskola. I thank the organizers for allowing me to do a five-minute, dance-along presentation on ‘Canadian progress in Ocean Literacy with the Voices of Youth’ in the closing ceremonies. I am personally grateful to the American organization, National Marine Educators Association (NMEA) for a scholarship that helped me to attend. I hope that my tweeting and blogging goes a little ways towards showing my deep gratitude for that assistance to participate in the great conference that was EMSEA14. Thanks to Peter Tuddenham for the Creative Commons attribution on his photos. Gaelle Le Bouler opened the conference, addressing the audience from the perspective of the European Commission, where she is the Directorate-General for Research and Innovation. Gaelle put the importance of the conference into the context of current affairs in the European Union (EU) and emphasized the high-level, political will to advance ocean literacy in Europe. She spoke about the Galway Statement signed by EU, Canada and US and explained the structure and progress of working research groups. She shared her surprise with us at receiving thirteen proposals from consortiums responding to the EU Horizon 2020 call “BG-13-Ocean Literacy”. The results of that competition will be announced November 21st. Lisa Emelia Svensson, was the keynote speaker and as Sweden’s Ambassador for Oceans, Seas and Fresh Water, provides advice and expert guidance to the Swedish Minister for the Environment on the action needed to move forward on Sweden’s international ocean and water agenda. She is part of the Foreign Service and spoke knowledgeably about ocean issues, the different sectors, sustainability, politics and ocean literacy. She inspired all of us to view potential challenges as opportunities, by thinking outside of the box for a blue economy that is integrated with the green. Dr. Lisa Emelia Svensson, keynote speaker. Photo courtesy of EMSEA Conference Handbook. Lisa Emelia reminded us that new approaches, such as ecosystem-based management, must be explained to people with language that they understand. Sweden has committed to an ecosystem approach by 2018 and people need to understand the benefits. 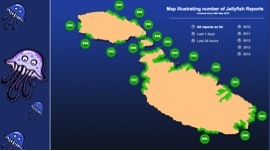 Ocean governance is also a challenge as there are 576 bilateral and multi-lateral frameworks. The Ambassador spoke about a broad range of topics from maritime spatial planning, to maritime transportation, to innovations for a healthy planet, new consumerism and social media. The Ambassador made the case for science and passion to work together and emphasized the importance of cross-sector work within government. She reminded us that Ocean literacy is also needed within the government and she reported that on a global level, there are a lot of events and activities that can raise awareness about the ocean. The Ambassador brought the audience back to self and the importance of individuals at the end of her talk, reminding us that ideas and leadership come from individual people. She suggested facilitating dialogue between scientists and policy makers, by starting at a local level and then scaling up. It was a complete treat to experience the Swedish Ambassador’s presentation. In my view, the creation of ambassadorships for oceans and water in more countries would help further global ocean literacy faster than any action, especially if the ambassadors could measure up to Lisa Emelia Svensson. John Parr (MBA) takes over from Geraldine Fauville.Photo by Peter Tuddenham Citation: VLIZ events / Tuddenham Peter This work is licensed under a Creative Commons Attribution-Noncommercial-Share Alike 3.0 License. The first session presenter was Joachim Dengg from GEOMAR in Germany. He questioned whether school outreach in marine research was a welcome addition or an extra effort and concluded that scientists needed to be able to choose. He demonstrated the positive difference to the efficacy of outreach efforts that a judicious coordinator could make and how he plays this role himself. He also acts to protect scientists so that they can do their jobs. There are about 500 scientists at GEOMAR working on topics such as ocean circulation and climate dynamics, marine bio-geology, deep sea, natural hazards, resources from the sea and plate tectonics. • Public visibility – public outreach, challenge communication skills of students by having them produce videos etc. In answer to questions, Joachim pointed out that the amount of time scientists put into outreach varies from zero to less than five percent and there is nothing prescribed, it depends on the principle investigator. He said that PhD students are favourite “victims” except in their last year when they are writing up and he stressed that this experience is invaluable in improving their communications skills with people who are not in their speciality. NMEA has fun. Photo by Peter Tuddenham Citation: VLIZ events / Tuddenham Peter This work is licensed under a Creative Commons Attribution-Noncommercial-Share Alike 3.0 License. Sam Dupont presented on a case study of the Monterey Bay Aquarium Research Institute’s Facebook page and ocean literacy. The question was: can Facebook be used to increase scientific literacy? Sam started with a quote from Tim Minchim, “the main problem is a failure to communicate” and made the point that FaceBook has over 1.3 million users. Geraldine Fauville, the PI, was at MBARI for ten weeks and had access to their amazing stories and materials (photos and video). She was looking at how to optimize the posting strategy to engage and interest and was evaluating this using quantitative (#fans, etc.) and qualitative (Interviews around – Does it increase OL?) techniques. Findings indicate that strategy doesn’t seem to change number of fans. The numbers reached were very variable 50 to zero per day whether there was a post or not. She found that there are more hits if there are photos and videos. The FaceBook model created by the genius, billionaire was cracked at 89% with the researcher team’s own algorithm and the conclusions were: use visuals, post as often as possible and when does not matter. They found that fan-fan interactions were superficial and that the fan-friend level was a little less superficial and more interesting because you discuss with people you know on your own page. They found that the type of fans were mostly from the US, connected to MBARI or had visited, with lots of marine scientists and students. The authors felt that there was a lot of investment of time and energy for a potentially limited rewards since it was a little like “singing to the choir”. A tweet by Jim Wharton, Seattle Aquarium was a good reminder that “singing to the choir” is not in vain as it supports them in communicating to their networks which adds to the ripple effect that can ultimately have the most impact. Alain talked about several IOI citizen science projects such as Spot the Jellyfish, which involves a range of ages from school children, to mobile phone users at sea, who photograph jellies and send them in along with location data. The program has produced posters, waterproof jelly guides, GIS jelly apps for iPhone and android, and postcards. IOI has also produced three popular under-water documentaries on Marine Protected Areas as well as YouTube videos. They assist in video production and video screening for pupils in schools. IOI is interested in taking this maritime hub further and is seeking partners on possible projects. They will be hosting the PERSEUS conference in November 2015. A question about divers had Alain pointing out that Malta has about 100,000 SCUBA divers visit annually so the potential for “citizen” science is great and already happening with invasive species. Portuguese youth with their teacher. Photo by Peter Tuddenham Citation: VLIZ events / Tuddenham Peter This work is licensed under a Creative Commons Attribution-Noncommercial-Share Alike 3.0 License. The flash (one minute) poster presentations were a really great way for everyone to hear from all of the poster presenters and helped inform later discussions at the posters. Portuguese high school students and their teacher presented my favourite EMSEA poster. It outlined their original research on beach micro-plastics from clothing and gave us all a reason for ocean optimism. The integrity, passion and excitement of youth, certainly gives me hope for the future. Litter surveys – Learn about data crunching and discussion. How are local animals are effected? Learn about basic biology. 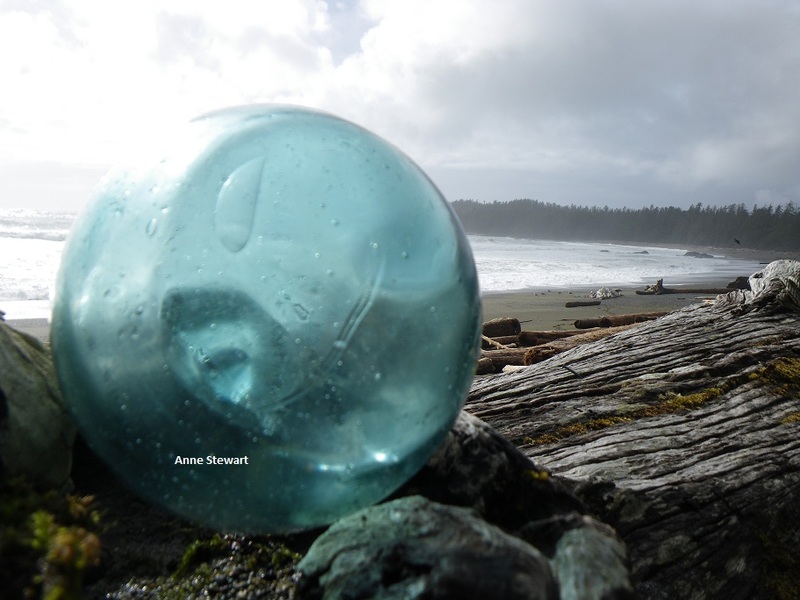 The second type of program Annie and Susan presented was a five day program culminating in a multi-school event and it involved, raising awareness about ocean litter through art – music, poetry and posters. On the final day (day 5) all five schools got together on Oceans Day. There was a marine mammal talk (plastics effects), sand sculpturing, a poster competition, they created huge collage, made a giant plastiki boat, sang sea shanties, wrote a messages in a bottle with what they learned and a pledge of what they would do to help. Susan and Annie reported that the student buy-in is instant: they get to be creative, they gain confidence, and the legacy is that they become the teacher. Children and teachers were absolutely ‘hooked’ and all the resources are free on-line. Advice for the audience: Make it relevant, achievable and fun. Support for this program, was provided by external funding from a pharmaceutical company. 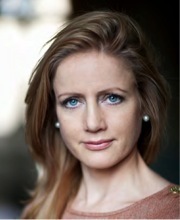 Check out Mirjam’s great blog. One of my favourite sessions at EMSEA was a hands-on lab led by Mirjam Glessemer. Mirjam took her learners, on adventures in oceanography and teaching right in the classroom. Her methodologies advance learning speed and depth through enquiry, peer-to peer learning, building on prior knowledge and understanding prior misconceptions. This was a busy, noisy, engaged workshop where everyone was talking, manipulating water, salt and ice and reasoning. It was a whole lot of fun. The foundation of the session’s lesson plan was based on a seemingly simple prediction question: which will melt faster, an ice-cube in fresh water or in saltwater? Mirjam has her students make a prediction to force them to commit to one choice so they are more invested in the outcome of an experiment (or even explanation) later on. We were all invested and delighted to see the oceanographic connections made as well as the increased understanding of oceans and climate that can come from such a deceptively simple experiment. This is a great reminder about the power of doing science instead of just reading about it. It took me quite a long time to get around to writing this blog, so this last comment is definitely dated. Check out Mirjam’s December 1, 2014 blog-post for teaching ideas and resources and respond to her challenge. Set me a challenge: What ocean/climate topic would you like to see a demonstration on? Nia Half Jone presents. Photo by Peter Tuddenham Citation: VLIZ events / Tuddenham Peter This work is licensed under a Creative Commons Attribution-Noncommercial-Share Alike 3.0 License. Nia Haf Jones presented on the Nautilus Exploration Program, which uses tele-presence technology to inspire the next generation in real-time. Nia is a very passionate Science Communication Fellow with the Ocean Exploration Trust, when not working with north Wales Conservation Fund. The Science Communication Fellows are trained at NOAA’s Inner Space Station at the University of Rhode Island, the site of next year’s National Marine Educators’ conference. 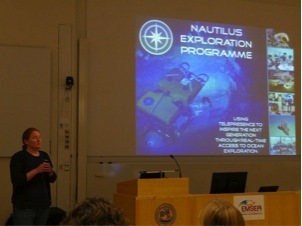 They also go to sea aboard the Nautilus for three week expedition and engage learners in events over the year. As a marine educator you can apply for this awesome experience. Everything done on NOAA Explorer is on-line including lesson plans created as part of graduate credit for teachers, and footage from NOAA. During the lunch break we had a brief but really great tele-presence connection with the Nautilus crew as they did a deep dive in the Caribbean. That was an unplanned but awesome addition to the program. Portugal stands out as a maritime nation that takes ocean literacy really seriously and Canada is looking to the Portuguese experience as well as the Americans for inspiration. I was in awe of the work presented on the importance of maps to Portuguese national identity. Portugal – wanted to change the idea of Portugal just being a strip of land in southwest Europe, with their Atlantic islands as an inset. They designed a map for youth to help change their view of their country and extend their perspective out to sea. They didn’t wait for the UN to finalize the extension of the continental shelf and went ahead internally. 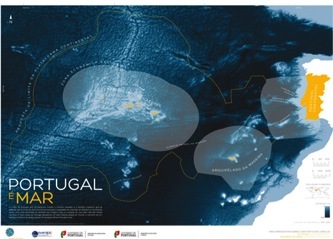 The beautiful new map, places the outer limit of the continental shelf and Portugal on the right side, with the map centered on the sea. It was validated pedagogically and maps went to all the schools. Politicians (even the President) and the media got involved and there was lots of coverage by the press. The educational team created teacher’s resources for geology, economy, ecology, pulled together lists of hands-on and minds-on activities, and the mapping team made maps of living and non-living resources, which all help in learning through discussion and debate. Workshops and teacher training was carried out to satisfy teacher’s needs for information, resources and access to the teams. Further links were made between the policy makers and educators/schools. I really like the way Portugal tackles Ocean Literacy and identifies itself as a maritime nation. Check out the map web site even if you don’t speak Portuguese: Kitdomar.emepc.pt it is pretty inspirational and you can always click on translate. The last session I am going to cover is that of Luc Zwartjes: this amazing Belgian geography teacher led a great open source GIS workshop that demonstrated how creating and manipulating maps can increase ocean literacy. In brief, he had a group of GIS neophytes making and saving ocean maps of wind-farms and shipping routes in no time at all. We can all be thankful that Luc also trains teachers amongst his many other contributions and accomplishments. Before signing off here I have to add just one more tantalizing link and that is Discovery of Sound in the Sea This is thanks to Gail Scowcroft’s thought provoking presentation on ‘The science of underwater sound: merging research, education, and policy.” Yes, keep the scientists involved for good outreach. If you want more, check-out the EMSEA conference web-site links. 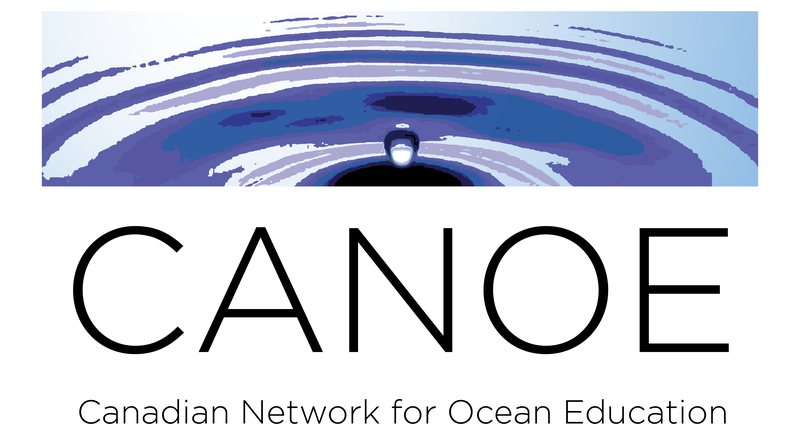 Categories: Uncategorized | Tags: Canadian Network for Ocean Education, CaNOE, EMSEA, EMSEA14, European Marine Science Educators Association, GEOMAR, MBARI, National Marine Educators Association, NMEA, ocean literacy, oceanliteracy.ca, University of Gotenburg | Permalink.